ROHO Low Profile Single Compartment Wheelchair Cushions BUY ROHO Wheelchair Cushions, ROHO Low Profile Cushions, Low Profile Wheelchair Cushions, 1R99LPC, 1R910LPC, 1R88LPC, 1R109LPC, 1R1010LPC, ROHO Cushions. ROHO LOW Profile Wheelchair Seat Cushions offer wheelchair patients who are at risk of pressure wounds a much better air padding option. 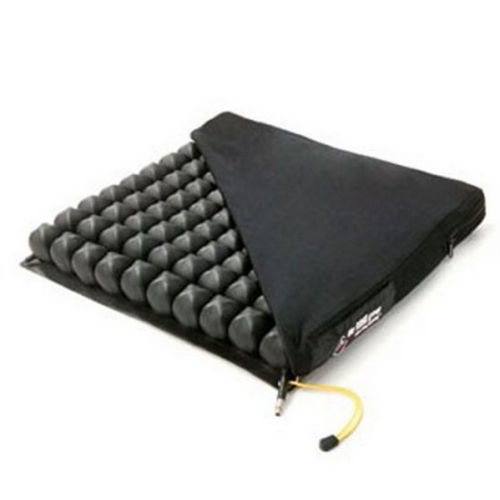 This Air Cushion is also great for individuals who want a softer and more comfortable seating cushion. The ROHO Cushion weighs only 2.5 pounds. Using proprietary air seat technology, ROHO’s unique design allows the seat cushion to constantly adjust to a person’s body movement. The adjustment and conformity of the air cells accommodate and meet the one-of-a-kind skin integrity needs for each individual. The ROHO Low Profile Single Compartment Wheelchair Cushion is designed for patients at high risk of pressure ulcers. ROHO also makes a High Profile Wheelchair Cushion that has 4 inches of height.The ROHO Low Profile Wheelchair Cushion has 2 inches of height with interconnected air cells that adjust to individual needs. Manufactured by the ROHO Group, this Low Profile Wheelchair Cushion is made with a single compartment with one air valve for easier inflation. This Low Profile Single Compartment Wheelchair Cushion auto adjusts to each patient. Single Compartment Air Cushions provide low deformation, counter-pressure that allows ischemic ulcers to heal. Cellular design provides adjustment and displacement to fit individual needs. Soft pliable air cushion material. Designed for high risk ulcer patients. Assist in the healing of ischemic ulcers. Cushion is easily cleaned with soap and water. Size Options (Inch, Width x Depth): 15 x 16, 16 x 16, 16 x 18, 18 x 16, 18 x 18. Interconnected Air Cell Size: 2 Inch. ROHO Low Profile Wheelchair Cushion Manufacturer’s Warranty: 2 years. ROHO Low Profile Wheelchair Cushion Product Numbers: 1R99LPC, 1R910LPC, 1R88LPC, 1R109LPC, 1R1010LPC,. 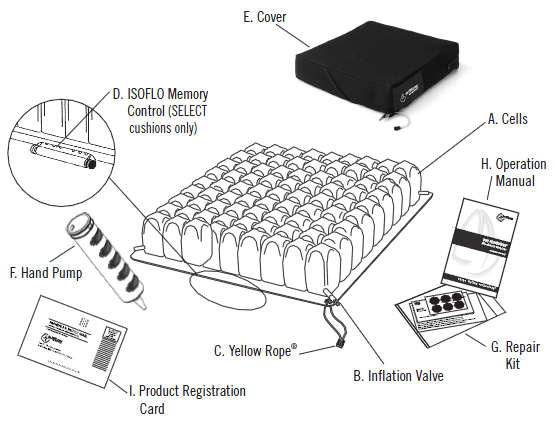 ROHO Low Profile Cushions offers information about applications and specifications. 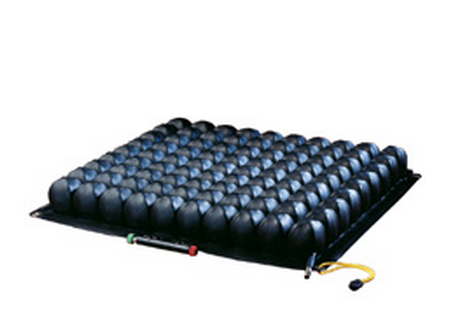 Dry Floatation Cushion offers information on air floating seat technology. 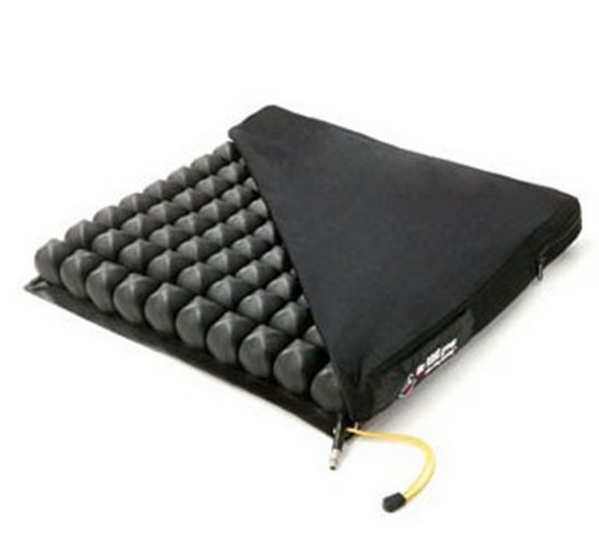 Dry Floatation Wheelchair Cushion charts the number of cells by cushion dimensions. I ordered a Rohi cushion for my father , needed it ASAP as his had deflated permanently. The customer care on the phone that I received was some of the most informative and compassionate I have dealt with in all the years of buying supplies. The cushion was exactly what we needed and it arrived a day early. What a relief to know we've found a company that we can count on for all our needs, the price was almost 200.00 cheaper than what we'd paid previously. The new customer discount, sale price and friendliness made all the difference. The cushion is Great! I actually cried with relief that the purchase was correctly handled and my Father didn't have to worry. Thanks so much. My Roho cushion is only 2 inches high but provides great comfort. I tried the larger one that is 4 inches high but it was way too big for me. It was like sitting on stilts. The 2 inch Roho cushion is just right.I use to have pressure sores from sitting in my wheelchair all day. This cushion allowed my sores to heal and keep them from coming back. This air cushion allows me to float on my wheelchair. It does seam to get leaks often but my younger brother easily patches it back up for me with the repair kit that is included. I used my Roho cushion in my car as well. It is very lightweight and easy to transfer from the wheelchair to the car seat.